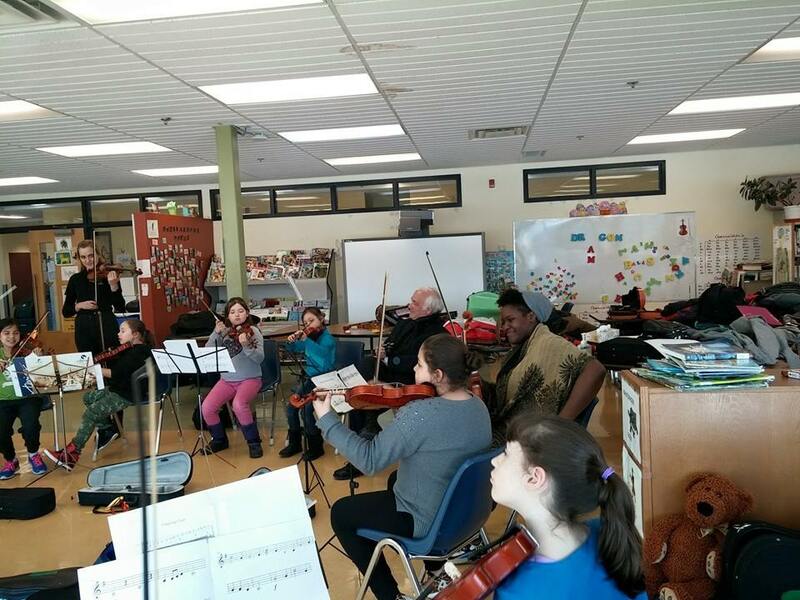 Musicians of the UNC Charlotte Chamber Orchestra collaborating with children at Kahnawake, Quebec. The gentleman in the center of the image is Ken Lambla, Dean of the College of Arts and Architecture at UNC Charlotte. Well before the UNC Charlotte Chamber Orchestra spent a full week in Montréal this past March, I vowed not to call the trip a tour. It’s long been fashionable for youth and even university orchestras to trot across the globe to exotic locales, normally at the expense of the students, or more likely the typically well-heeled parents, under the guise of “touring.” Fashionable, fun and rewarding for the participants, but beyond that small circle of individuals, of very limited social impact. Many cities are visited, many attractions are photographed, and the twelve people who attended the concert in Brno or Lijiang, including the orchestra chaperones, can be counted on to leave the church feeling re-energized by the inspirational power of youth. Given how many youth orchestras are suddenly parroting Sistema speaking points without any change in practice, either operational or pedagogical (there are some notable exceptions), I will take the initiative to clarify what differentiates a service residency from a tour. In my mind, musical service residencies have four key components. The key word is service. Most significantly, in this context, performing on its own is not service, regardless of venue. Concerts in schools, hospitals or retirement homes, or flash mob presentations in a train station or town square do not constitute service. Service requires genuine and repeat engagement with the constituents to be served. Multiple interactions are essential. The experience for visitors and visited should be sustained and immersive. Accordingly, it is a residency. A week of contact is the barest minimum for the engagement to be meaningful; anything less and you can hardly be said to be “in residence.” The destination can serve as a base of wider operations, but for the purposes of both pedagogy and service there should be but one base. It’s not possible to serve a community without some understanding of its context, needs and challenges, so students should engage with the town or city as much as its inhabitants. There are clear social and pedagogical objectives. In the example of Montréal these were not sophisticated or unduly philosophical: students from UNC Charlotte delivered a pre-determined number hours of group and private instruction, observation and collaboration in local programs, with collaboration in this context referring specifically to side-by-side rehearsing and preparation for a joint performances in strategically chosen venues. A service residency isn’t pay-to-play. As a pillar of the concept, all housing, flight, and ground transportation costs were covered, with students responsible for some minor incidentals. The rationale for this was fairly simple: to be true to the values to which Sistema aspires, this venture had to be as accessible as possible, and very few students had the means to pay or the time to fundraise. The schedule for the students was, in their parlance, brutal. The residency took place in the middle of the semester while classes were in session, so students were trying to keep up with coursework while working full days in Montréal, leaving few hours (but some) for seeing the city. Accessibility was only one part of the equation. From my perspective, it is important to treat my musicians as the young professionals that they are, and accord them a similar degree of respect for their efforts. If they want to sight-see, they can do it on their dime. If I want them to work their tailcoats off, it should be on my dime. 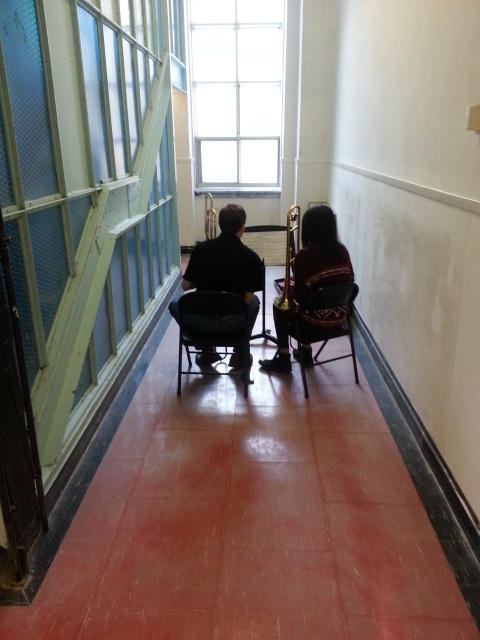 Nathan Ricer, UNC Charlotte Trombone major, teaches a lesson in a stairwell. The sine qua non of a venture like this is an outstanding partner, which UNC Charlotte had in FACE School, its Foundation, and orchestra director and Sistema mover-and-shaker Theodora Stathopoulos, who in addition to rehearsing six orchestras at FACE also finds time to lead two Sistema programs in the Montréal region. None of this would have been possible without her and her exceptional colleagues, to welcome us into their facilities and integrate our students into their teaching teams and ensembles for a full week. A few of my colleagues in the sector have voiced their growing concern over what might charitably be referred to as “Sistema Theatre.” You’ve probably seen the videos: giant massed orchestras, bright coloured shirts, exaggerated stage motion culminating in a strangely anti-social camera focus on hyperkinetic podium flailing. Spectacle has always played an important role in advocacy, and to some extent it has become essential to communicate both the spirit and the achievements of the sector, but in some cases the theatre has replaced real social impact. It was important to Theodora and me that what we planned in Montréal had integrity of purpose and outcome. Jamming kids together for a concert wasn’t enough. As the culmination of our week of collaborations, site visits, rehearsing and teaching, the combined forces of FACE and UNC Charlotte performed two concerts of Latin-infused music, but in venues important to the communities in which the Sistema programs were embedded. No coloured shirts, and my hair isn’t long enough for me to get away with hyperkinetics. There was spectacle, but even the spectacle was in service of two marginalized communities, one of which had never been visited by a symphony orchestra before. The difference between a tour and a MSR is love; properly defined.